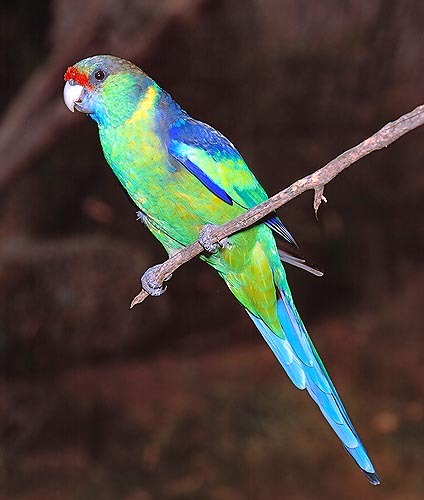 The Barnardius zonarius barnardi Shaw, 1805, called Bernard Parakeet or Australian Ringneck, due to the presence in the various races or subspecies, of a yellow band around the neck, belongs to the genus Barnardius, family Psittacidae, subfamily Psittacinae. 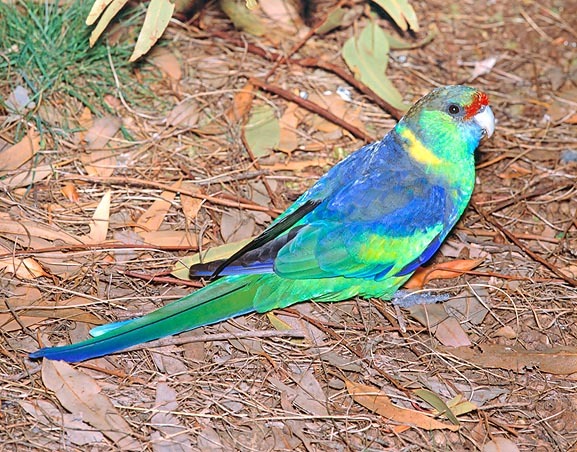 At home in all regions of Australia, it forms along with the genera Melopsittacus, Lathamus, Neophema, Neopsephotus, Psephotus, Platycercus, Polytelis, Purpureicephalus, Aprosmictus, Alisterus, the substantial group of the Australian parakeets. Once, the Barnardius zonarius barnardi was placed in the similar genus Platycercus, that of the parrots commonly called Rosellas, but later, due to the colour and the robust conformation, they have been placed in a genus apart. They are very colourful birds, some of them with really showy plumages. When in captivity, they need spacious accommodations; and although time ago they were very much commercialized, since about ten years Australia has forbidden their export, which is allowed only in exceptional circumstances, to a limited number and at very high costs. Both in the wild and in captivity, the biology of the species is not much clear. Mostly, they are not very noisy animals, which emit whistles variously modulated, in some case melodious, well different from the strong and harsh screams of the South American parakeets. They are all autochthonous birds of Australia that within the species Barnardius barnardi Vigors & Horsfield, 1827, counts the subspecies Barnardius zonarius barnardi, Barnardius zonarius macgillivrayi, Barnardius zonarius semitorquatus and Barnardius zonarius zonarius. Present mainly in the Australian forests, they carry an arboreal life, in groups of three/four couples, or in wider crowds. Although CITES and IUCN have classified them as species in rarefaction or at risk, the human local pressurization, with relevant deforestation, in a continent already characterized by vast semi desert areas, has compelled the Australian Government to limit their commerce. They can reach the length of 35-36 cm, a weight of 110-150 g and live up to about 20 years, 15 as an average. The males have a bright green coloured body, with blue cobalt tracts on the wings, in the upper part of the covering ones, and on the lower one of the same. The neck is shaded of blue, the upper part of the skull is grey, the tail bright azure, the beak white in the upper hemi-portion and grey in the inferior one. The iris is dark brown. The upper part of the abdomen can have tones from yellow to pale orange, and it is well evident the yellow ringneck, which rightly originates the name of Australian ringneck. But mainly the males distinguish for a red frontal band, clear character of sexual dimorphism. The colouration in the females is usually paler. The green is less bright and starting from the back to the tail it assumes an olive-green-brown colouration. Also the yellow ring around the neck, forming the collar, is less bright. The band of red feathers on the front is lacking and the abdomen is pale yellow. Living in a somewhat poor habitat, they have evolutionally adapted to a diet which is not terribly rich. They are granivorous, they nourish mostly of dry seeds, but they can integrate the diet with legumes, which provide a protein input. Both in captivity and in the wild they have a good rate of prolificness, as an average males and females are apt for mating when one year old. The male is dedicated to the building of the nest and to the feeding of the newborn pullets and of the mate during the clutch, which seems to be lasting up to 20 days. It is thought that 3-4 eggs are laid (data still under verification) for each brood, and there can be even more clutches per season.